The PDF update manual demonstrates that the v7.2 update goes well beyond being a straight conversion of Logic Pro for use on Intel-based Macs. The announcement of the new Intel Macs at Apple's World Wide Developer Conference in January was quickly followed by the news that the Intel-ready Logic v7.2 would be released in late February. 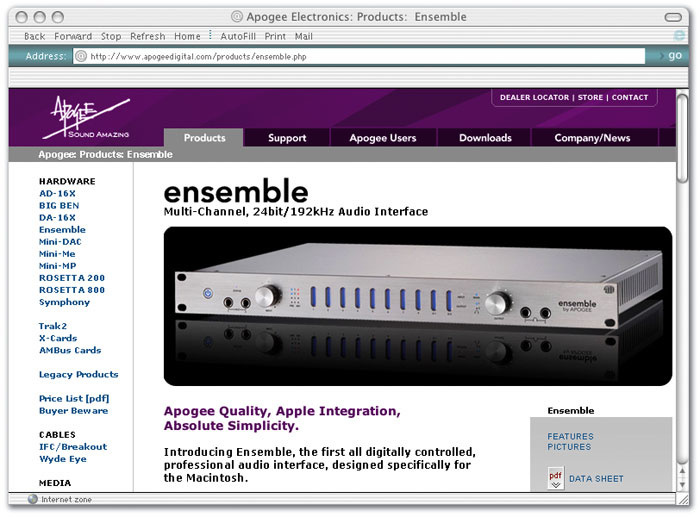 Details of the release were sketchy — but a couple of pieces of available information had Logic users posting on the various Internet forums (such as those at www.yahoo.com and www.osxaudio.com) in their droves. Apple announced that the Universal-Binary crossgrade, which runs on both Power PC and Intel Macs, would cost $49 and contain the 'jingles and sound effects' that were included with Garage Band 3. Sound On Sound received emails complaining that Apple had removed discussions about the latest version of Logic on their support forums at www.apple.com/uk. However, to be fair to Apple, the small print on their site prohibits any criticism of their products, which is why it's always a good idea to frequent the SOS Web Forum for the real skinny on Logic developments! The misinformation superhighway went into overdrive with rumour and speculation. Would the Power PC version be crippled to make the Intel version seem faster? Were there any bug fixes? Were there any new features for your money? Small leaks appeared until, on the day you could actually order v7.2 from the Apple web site, a PDF update manual (http://manuals.info.apple.com/en/New_Features_in_Logic_Pro_7.2.pdf) became available, which clarified and obfuscated the situation in almost equal proportions! The price (including VAT) to UK users is £35 plus postage. When v7.1 was released, Apple started to offer free postage a few weeks after its initial availability, so by the time you read this you may be getting a better deal. The PDF file confirms that v7.2 does ship with the Garage Band extras, but also reveals that a slew of bug fixes and new features are also present. The PDF is confusing, in that it lists the new features of v7.2, but mingles them in with details of all the extra updates since version v7.0. This makes it hard to decipher exactly what is new in v7.2 itself. But what seems clear is that Apple have made the upgrade worthwhile — that is if you think the extra features are important to you. Probably the biggest headline-grabber is the deal between Apple and Apogee, makers of high-quality audio interfaces. 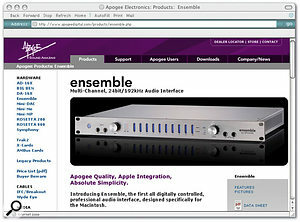 The Apogee Ensemble is a multi-channel 24-bit/192kHz Firewire interface that is fully integrated into Logic Pro — you can find full information about it at www.apogeedigital.com/products/ensemble.php. There have long been rumours of a possible Apple 'Pro Tools killer', and many have seen the combination of Logic and a high-end interface for around £2000 as proof of these rumours. 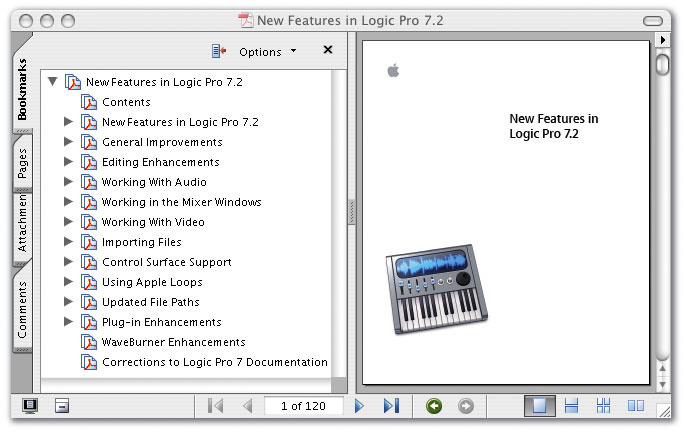 So the appearance of Pro Tools 7 support in Logic v7.2 must have been a bit of a surprise. Incidentally, Pro Tools 6 users should note that Logic v7.2 is not compatible with their version of DAE and TDM, and they need to upgrade to Pro Tools 7 if they want to use Logic as a Pro Tools hardware front end. Could Apple's new collaborative product with Apogee, the new Ensemble interface, woo Logic Pro users away from Digidesign hardware?An only slightly less sensational new feature of v7.2 is the ability to use an 'LE' version of Serato's Pitch 'n Time plug-in. This high-quality tempo- and pitch-changing plug-in was previously only available for Digidesign TDM systems, and it integrates fully into Logic alongside the program's current pitch-based algorithms. It's an AU plug-in, but works in the Time Machine or directly from the Arrange page Audio menu's submenus, rather than as a real-time effect. Speaking of the Time Machine, this old clunker really needs an upgrade, as it's difficult to use, unpredictable, and has the weirdest interface in Logic. There's been a lot of speculation about the pricing for the plug-in, with some saying that it will be as low as $99, but $399 seems about right for a plug-in that was previously only available at a much higher cost to Pro Tools TDM users. Serato's Pitch 'n Time has found favour with remixers and film-audio people for the quality and transparency of its algorithms, so its availability to those who work with Logic in these areas will be immeasurable. It's also an interesting alternative to Melodyne for the rest of us, with the advantage that it works right inside Logic without the need to use Rewire connections or external processing. Speaking of Rewire, Logic v7.2 now supports stereo rewire objects. I hope Apple have also worked on the overall implementation of Rewire, as it's always been a little flaky in Logic. The Apogee and Serato deals are another indication of how seriously Apple is taking pro audio these days. Another major enhancement is upping the number of mono outputs Logic can use with AU plug-ins from 16 to 32. This corrects a major limitation when using Virtual Instruments such as FXPansion's BFD drum module, and is alone enough for me to justify the price of the upgrade. You can also now reassign Track Instruments on the fly using MIDI Program Change messages. This means that you can select different virtual instruments and their associated plug-ins, or change the processing on an audio track as the Song progresses. It'll be interesting to see how this works in practice, as there will be an appreciable delay as new setups are loaded. This goes some way to addressing the need to process different audio regions on a track with different effects, but it's no substitute for the 'process region directly' feature that is a common request from Logic users. Several of the enhancements in Logic v7.2 deal with control surfaces, and there is now native support for the M-Audio Garage Band-specific iControl reviewed in SOS December 2005. Depending on how well it's supported 'out of the box' this could be an inexpensive way to try out a hardware controller with Logic. One of the new features mentioned in the PDF which has caused some confusion amongst seasoned Mac OS X users is the Auto Hide Dock option, as this feature already appears to be in the System Preferences. Its inclusion has produced a few 'bloody Apple trying to charge me for a feature I already have' comments. However, Logic 's Auto Hide Dock behaves slightly differently to its Mac OS X cousin: while the latter only hides the Dock until you move the mouse over to the side of the screen where it's hidden, Logic 's version hides the dock completely when Logic is the front application. You never have to suffer from sudden Dock reappearance again! I really hope Apple make this a feature of all their programs. Incidentally, the Onyx system maintenance utility Version Tracker (available at www.versiontracker.com) allows you to place the Dock at the top of the screen, something that's not yet allowed by OS X itself. A lot of the other new features of v7.2 are perhaps not so 'pro'. 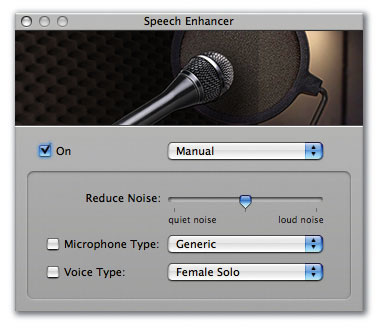 There's the facility to playback compressed files without conversion, a couple of plug-ins that are probably most useful when podcasting (Ducker and Speech Enhancer), a slew of new AAC output parameters, and the aforementioned effects and jingle audio files. But the extra Key Commands, Song end display on the Transport bar, and little bug fixes (such as the state of the faster overview calculation setting now being retained) shows that Apple are still committed to improving and updating Logic. Whether v7.2 is for you depends on your work flow, but considering the features added it's not just a crossgrade that's only useful for Intel Mac users.